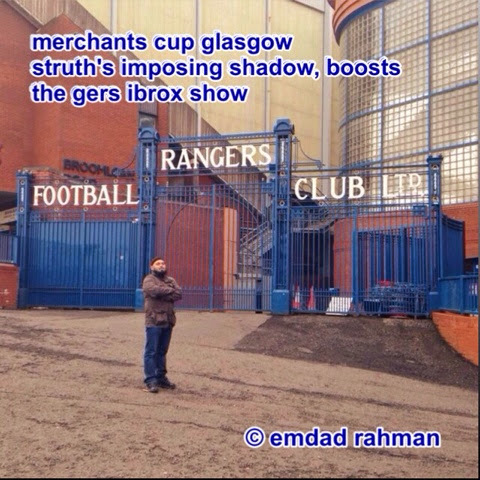 This is from my recent tour of the majestic Ibrox Stadium. Tonnes of photos were lost after the wally writing this jumped into St George's pool with the iPhone in the pocket. Chris Mayhead gave me and Mohammed the tour. He is a true scholar after having spent nearly three decades at Rangers. I was in awe of his sheer knowledge and passion. I hope I can go back next year and replace my pics, especially the Barry Ferguson mural in the trophy room. Hope to catch a match too and try meet a few players. There's more to come and I'll post a full review soon. Here's a haiku I composed earlier.